You are here: Home / Podcast Episodes / Why You Should Ditch Seller Scripts and Do This! 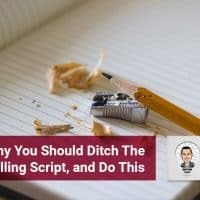 So many young and fresh real estate agents are tanking their chances with leads because of scripts. Scripts are inflexible and robotic. No matter how you come by your leads it is important that your conversation be natural and informative. On today’s episode we discuss how to handle a lead call the right way. Why a script is always a bad idea. How to build a rapport with the lead. The 4 questions to ask a lead. The importance of a marketing plan. If you want to hear more about this topic you can visit realestatemarketingdude.com and read the blog. To read the blog post click here.